The combination of overseas demand and a weak pound has helped push British vehicle production to its best month since 2000, according to the latest figures from the Society of Motor Manufacturers and Traders (SMMT). Production figures for March were 7.3 per cent higher, compared to the same month for 2016, with carmakers building 170,691 vehicles. This completes a buoyant three months, with British factories producing a total of 471,695 cars and vans in Q1 - an increase of 7.6 per cent on 2016. Exports were the primary driver behind the bumper figures, with demand up 10.6 per cent in Q1 (130,000 cars) on the previous year. As a result the UK now exporting a vehicle every 20 seconds; although, experts warn that the future of the industry is dependent on Brexit negotiations. “Much of our output goes to Europe and it’s vital we maintain free trade between the UK and EU or we risk destroying this success story,” said Mike Hawes, who is the chief executive of the SMMT. 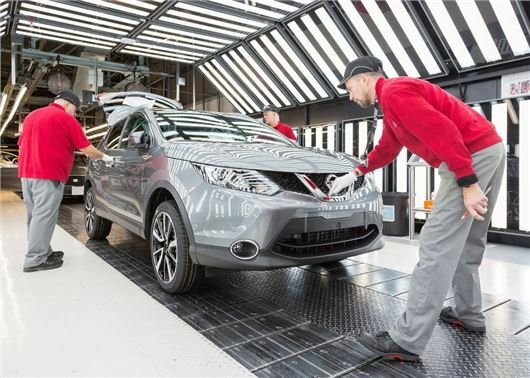 Nissan has offered Brexit reassurances by saying it will build the next-generation Qashqai and X-Trail at its plant in Sunderland. Honda has also said it will continue to build the Civic at its Swindon plant. The weak pound helped exports, by making it cheaper for Euro counties to buy goods from the UK. As a result the SMMT believes that production numbers could surpass the 1972 record of 1.92 million cars by 2020. In 2016, Britain built 1.7 million cars. The best-selling UK model is currently the Nissan Qashqai, with 475,000 built every year at its Wearside factory in Sunderland. The second most-popular is the Toyota Auris, which is built at Burnaston, Derbyshire alongside the Avensis. Jaguar Land Rover (JLR) produces the most cars in Britain, with its Liverpool and the West Midland plants building a total of 507,444 cars 2016. As a result, JLR now accounts for more than 30 per cent of all car production within the UK.